If you are visiting Miami, then visiting South Beach is a MUST. Do not miss the Ocean Drive and taking a dip in the ocean. the water is so pretty, looks Caribbean for sure. 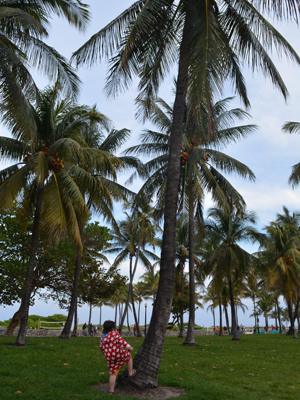 Plenty of entertainment as you walk along Ocean Drive and a wonderful stretch to take pictures. 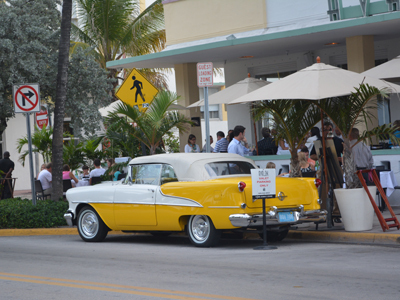 A short stroll to Lincoln road for more Restaurants and great shops. The beach is well groomed and nice to visit. We enjoyed swimming in the gentle waves. You can go pretty far out without it dropping off over your head. public parking is affordable and easy to get to. Couple blocks from the beach. We loved walking down the Art Deco District. 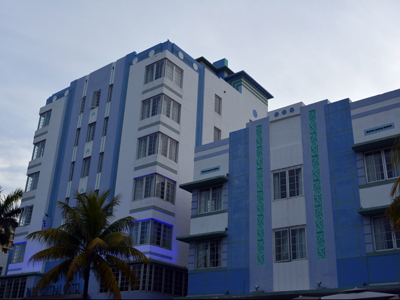 Miami Beach’s Art Deco District is the first 20th-century neighborhood to be recognized by the National Register of Historic Places, with 800 structures of historical significance, most built between 1923 and 1943. The fanciful pastel buildings, with porthole windows, ship-like railings, sleek curves, glass blocks, shiny chrome, and gleaming terrazzo floors are prime eye candy. We started our stroll where 5th Street dead-ends into the beach at Ocean Drive, heading north. 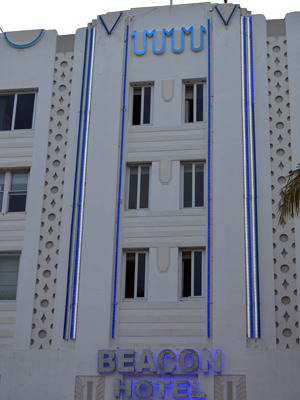 As we walked along Ocean Drive, we saw the porthole windows, curved metal rails and flags copied from the big ocean liners that docked at the Port of Miami in the 1930s. Tried to to shoot postcard pictures of each hotel but we definitely have to go back to take better ones. The most beautiful ones are: Park Central (between 6th and 7th streets). Built in 1937 and renovated in 1987, it was the first hotel to be returned to its original splendor. The hotel was a hangout for Hollywood stars, such as Clark Gable, Carole Lombard, and Rita Hayworth. Also in the 700 block of Ocean Drive: the wedding cake-like 1936 Beacon Hotel and the 1935 Colony Hotel, with its prominent sign and neon accents. Cross the street to linger at Lummus Park at Ocean Drive and 7th Street, where you can take a few steps east, over a dune, and be on the beach. Look back to the west for a great view of the Art Deco skyline, particularly stunning at night, when the hotels turn on their neon signs. There are usually musicians singing and playing bongos or guitars in the park. Back on Ocean Drive,we kept keep moving north past the Waldorf Towers, 860 Ocean Dr., with its round glass tower that looks like a lighthouse. When we got to 10th Street, we saw Art Deco Welcome Center. It’s home to the Miami Design Preservation League (www.mdpl.org), which formed in 1976 to save the historical hotels from being razed by developers and restore them to their glory days. There are books, brochures, and guided tours here. 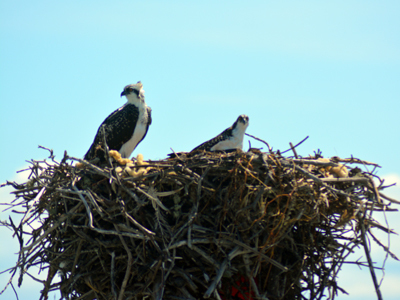 Self-guided tours are available Wednesday through Sunday. On the way to Miami, FL we decided not to miss a chance of getting two more Junior Ranger Badges for Nicholas. 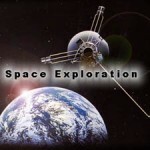 (We got the first one couple of years ago in Zion National park and ever since it has been a great way to learn about the history and nature of the United States). 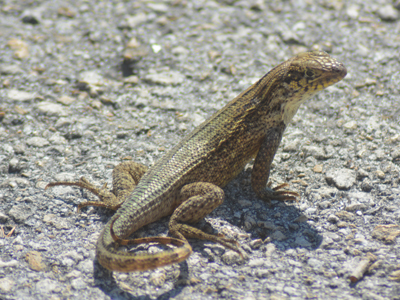 Before you go to Everglades with kids you should know that visiting Florida’s Everglades presents a few challenges… Since Everglades National Park was the first national park established to preserve biological diversity and resources, not for scenic views the drive has little variety or dramatic scenery. The solution is simple, stop at each and every one of the wonderful trails and visitors’ centers along the way and enjoy the trip. 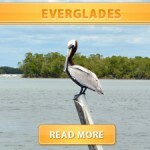 Everglades National Park was established December 6, 1947 and it covers 1,542,526 acres. 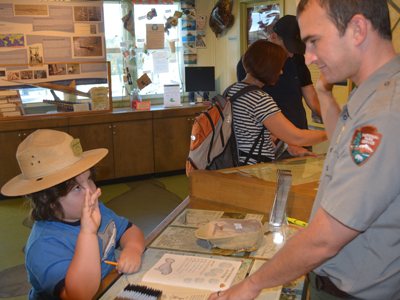 There are three places in the park to get your Junior Ranger badge (Big Cypress National Preserve, Biscayne National Park, and Everglades National Park) and if you visit all three of them you can get a special Junior Ranger patch. Since we were on the mission to get to Miami and back the same day we could not spend too much time in the National Park. But we are definitely going to be back for an airboat ride and to walk a trail or two. 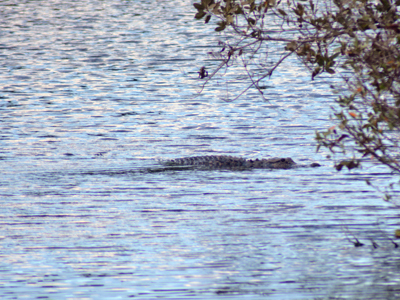 Even though we did not spent more than an hour in the Everglades Park we were lucky enough to spot a couple of alligators enjoying a sunny afternoon. 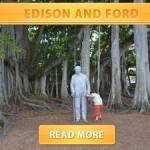 We visited Everglades in mid April, the temperature was ideal and we did not need mosquito repellent. But you should keep in mind that from May to October, insects may make visits unbearable, especially for kids. 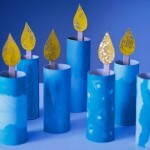 The wet season begins in June; summers are hot and humid, with many afternoon thunderstorms – and mosquitoes. Best time to visit is from November to March. We were told that wildlife viewing is best in winter too. Great day trip when in the area. We drove up from Naples, FL (approx 45 minutes) with a 7 year old who didn’t want to go, but after we did the self guided tour, he said it was fun. I am glad we went earlier in the day when it’s not so hot and we could spend several hours wandering through the estate. The grounds are quite beautiful and what an amazing feeling to know Thomas Edison once lived and worked there. We started the tour with losing Nicholas. Seriously, by the time we paid for a The Complete Estates Tour the kid was gone. 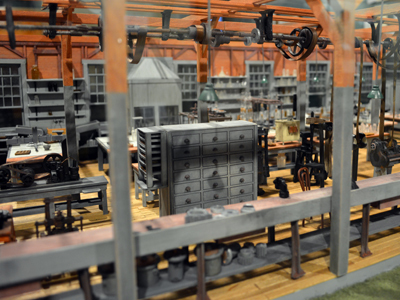 While we were looking for him all over the estates ( over 20 acres of botanical gardens, nine historic buildings including Edison’s Botanic Research Laboratory and the Edison Ford Museum), Nicholas was touring the lab. It pays to be cute, you can go anywhere you want without paying the admission fee ( even though it is not bad • Adult $20.00 • Child (ages 6-12) $11.00 •Child (ages 5 and under) FREE). Once we found Nicholas we started the tour with the museum and the Laboratory. 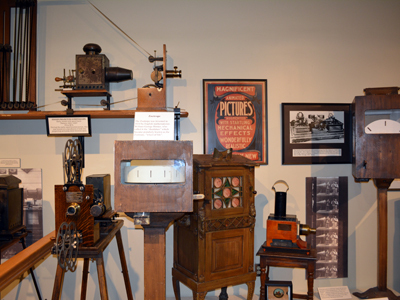 They have some really neat stuff there, kids can make a short movie and you can learn about Edison’s work and inventions. After that we crossed the road and enjoyed the tour of the grounds. The old homes are lovely, the grounds are beautiful, and one can get a sense of what it was like when Edison and Ford were sitting on the huge veranda enjoying a view of the nearby bay. Edison designed his beautiful homes that were adjoined by a walkway, and which have beautiful wrap around wide southern porches. 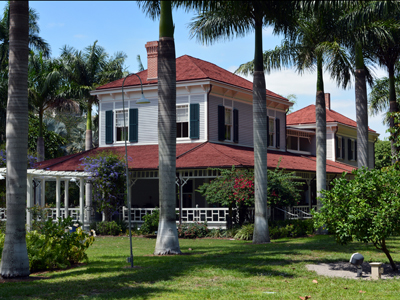 We enjoyed standing on those porches and looking into the rooms at the decor, and hearing about the history of the rooms, buildings,and gardens of both the Edison and Ford homes. The grounds are breathtaking with the myriad numbers of foliage. The great banyan trees are gorgeous too. 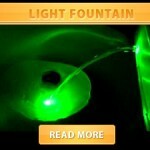 If you are in Florida with kids, this is definitely a piece of history you don’t want to pass up! 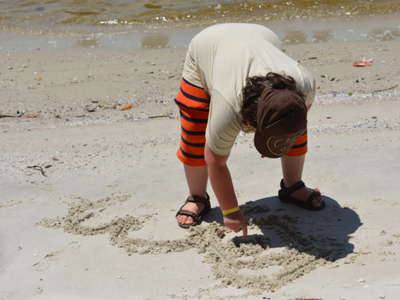 On our recent Naples, FL family vacation, we planned to spend most of the time at the beach, soaking up the sun and playing in the Gulf of Mexico. But we didn’t want to spend our entire vacation lying on the beach, so we planned a few activities. 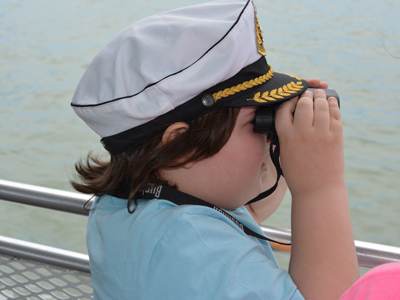 Our first was The Dolphin Study Eco-Tour and Cruise, which is the only Florida attraction featured in National Geographic’s 100 Places That Can Change Your Child’s Life. The Dolphin Study offer two cruises per day, and we booked an afternoon cruise since it was Easter day and we did not feel like waking up early. 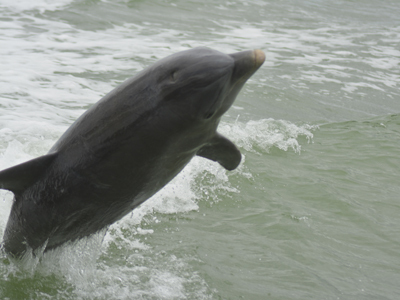 The Dolphin Explorer does offer cold water on board, and guests can bring food. We ate lunch right before our cruise, but brought snacks for the Nicholas. (Big waste since he was too busy watching wild life and swimming in the ocean to notice that he was hungry). At boarding time, we were introduced to both our ship’s captain and naturalist. The naturalist walked around the boat offering small clipboards with activity booklets for the children, as well as binders with laminated sheets featuring each of the dolphins we were hoping to see. 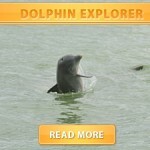 The kids filled out the activity booklets to get a Dolphin Explorer patch in the end of the trip. During the cruise, we also had the opportunity to stop at an uninhabited island to do some swimming and shelling. Each person was given a shell bag, and we could walk around the waterfront collecting the shells. 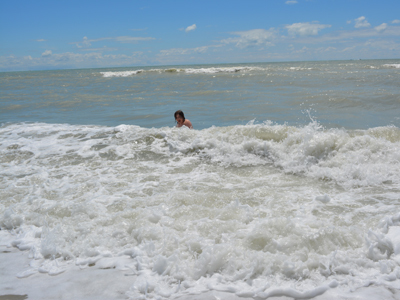 Instead Nicholas took his clothes off (thank Goodness we had his swim trunks with us) and spent entire hour swimming and jumping in the waves. The naturalist walked around, answering questions, and taking photos of each family upon request ( you could either have the picture printed at no cost or ask the naturalist to take the picture with your own camera). You can find out more, and book your tickets (definitely book in advance) at the Dolphin Study Eco-Tour and Cruise website.